These two Peter Griffin books, especially the first one, made the name of this wonderful and kind person to be at the one level with such blackjack idols as Al Francesco, Arnold Snyder, Stanford Wong and others. 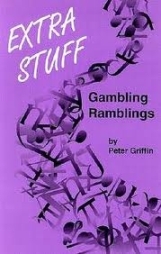 Though Peter Griffin was not a professional blackjack player, who spent his whole life playing and beating casinos at blackjack, his books are of the great importance for this card game, and even today all card counters do not refuse from reading them and finding there something new and useful for themselves. Published in 1978, this Peter Griffin book had become the bestseller at once and took a place in one row together with Beat the Dealer of Edward O. Thorp; Thorp himself described this book as being useful and very interesting to read. The Theory of Blackjack is considered to be one of the best books on card counting: experts describe it as being the one which should be definitely read by every card counter. It shows the fact card counting is not as easy as it seems to be at first; so, if you are just a beginner at blackjack, this book will be probably a little bit difficult to understand for you. This book does not give you any introduction of blackjack or card counting itself: the author describes everything in a way as if you already know blackjack and its counting systems rather well. This book has complete basic strategy of blackjack and describes methods of playing blackjack behind modern card counting systems. Though you can find much of mathematics inside, this book is easy and understandable to read: written in the form of articles about gambling, it gives analyses of different gambling systems together with abstract concepts. Published in 1991, Extra Stuff became the second book of Peter Griffin which made him popular and read blackjack author. If his first book is preferably for advanced and experienced blackjack players, this one can easily be understood by everyone thanks to Griffin’s perfect style of writing and his humor.